Erez Bar-Nur, founder and lead designer of Landscape Design Workshop re-envisioned this extensive 60,000 square foot recreation deck as a focal point for a waterfront condominium complex. The landscape architect created a grid system based on the structural columns of the garage below. This grid system provides the rhythm for the design, but also serves a practical purpose; all new structural elements are placed directly over a column below to minimize the need for structural modifications. The landscape architect worked with the Homeowners to identify amenities that the residents would use and appreciate the most. 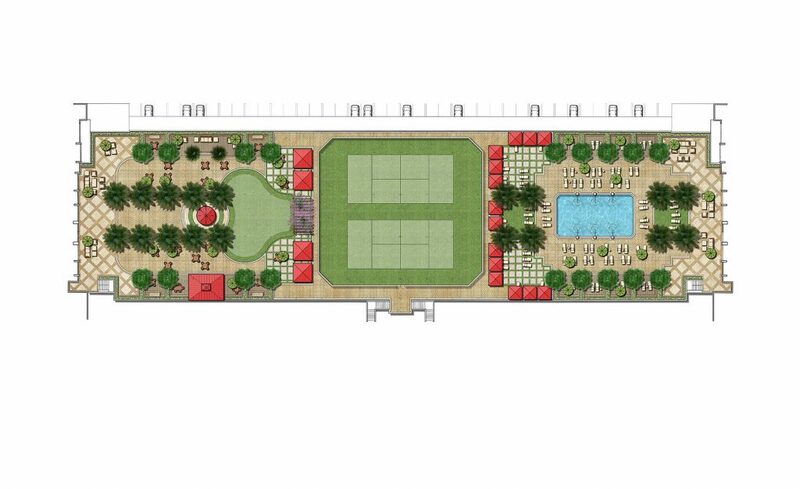 The recreation deck was then divided into three activity zones: the pool deck and cabana court area, the café and putting green area and the tennis courts in between. The renovation of this extensive deck provided a focal point for the community through the addition of resort-like amenities. The residents now have a place for outdoor cooking, dining, tennis, lounging, socializing and entertaining. Led a team of design consultants and provided landscape architecture and planning services for the renovation of a 60,000 sq. ft. amenity deck built over a parking garage. Services included hardscape design, planting design, irrigation design, lighting design, furniture layout and construction administration. The design elements included pool with decorative pool fountains, cabana court, palm courts with artificial sod, tennis courts with artificial turf, café structure, summer kitchens, putting green and lush sea-side planting.